Fitness Model & Actor Greg Plitt Interview: From West Point To Hollywood! When I was at West Point, I began to date an actress in New York City and every time I came down to the city, she would always have me read lines... Here's the rest as he goes from the military to Hollywood! In this interview we are going to focus on your recent and upcoming movies you are in. How did you get into the acting side of the industry? "A Seed Was Planted That Took Root Quickly And After Uncle Sam Had Finished With Me." When I was at West Point, I began to date an actress in New York City and everytime I came down to the city from West Point to hang out, she would always have me read lines with her so she could practice for whatever audition she had coming up. I didn't know the first thing about acting or lines or anything related to the subject, but what I did know is how amazing it was that this girl I knew had so many different characters within herself. Unbeknown to me, a seed was planted that took root quickly and after Uncle Sam had finished with me and my requirement with the military, it quickly started to blossom into the career I am currently undertaking. You have always been in the spotlight for photo shoots. What is it like tackling the big screen? Well, tackling the big screen is one of those impossible tasks, it is more like trying not to get tackled by it! Being in any movie is such a natural high and prideful moment. To be apart of so many professionals collective efforts that hopefully dives inside a person watching and causes a moment for them is magical. The process of being an actor where you travel in your mind to become a different person and character is one of the hardest tasks and, at the same time, most rewarding tasks I have ever done. Being a model on a photo shoot is all about capturing that instant moment that portrays a story, while film is capturing the story and telling it from start to end. What is it like being in movies and seeing yourself play in roles? Seeing yourself in a movie is a mixed bag of emotions. Initially, you are excited and honored and see yourself as a means of accomplishment and culmination of tons of work wrapped up and delivered into a moment. The initial moment is just that though as you quickly become your own critic and evaluate your performance and judge the good and bad and find ways where you can improve to make it better. Were movies something you always wanted to get into? Movies were always something I loved to watch and get inspired from, but I never thought about acting, modeling, or the entertainment world whatsoever growing up. For me, it was all about sports and schoolwork... where that was to lead was to be discovered. What was it like shooting in your first movie and what did you gain from that experience? I got lucky out of the gate with acting. I crashed an audition in NYC when I just got out of the military. All I knew was the address of the casting director and timeframe they were seeing people. I walked in and made up an agency, put my number as their number, and waited for 3 hours until they finally let me in to audition out of sympathy I think. The role was alongside Robert DeNiro and Matt Damon in The Good Shepherd and even though most of my lines were cut out of the film after being on set for 3 weeks, I got to see how the pros do it in Hollywood. I saw the best of the best perform in front of the camera and behind it and right out of the gate witnessed what 'right' was and what to aspire towards. Greg Plitt on set with director Robert Dinero. How different are movies than photo shoots? Do you change up your diet or workouts? Movies or any type of film, you don't play yourself, you are simply a vehicle to project a character... almost as if the character's ghost enters your body and pays rent for a while. A photo shoot is about you and your physique, where a movie role is about a character and the character's instincts, not yours. Depending on the role of the character will determine what your workout is to match the body and spirit of the character. Christian Bale in The Mechanist and then doing Batman shortly after is the perfect example of an actor changing up their workout for the role. You are currently in the movie "Watchmen" as the blue character known as 'Dr. Manhattan'. They actually used your body and superimposed it onto another actor. Was it weird having them use your body and not having you play the whole role? 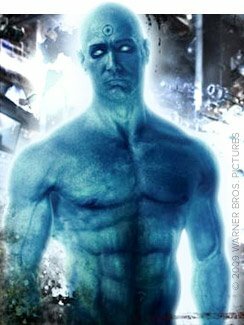 Being selected to play the role of Dr. Manhattan in Watchmen was a tremendous high for me. When the director, Zack Snyder, told me it would have cost millions to CGI a superhero and have all the muscles move like a human and when they found me in the shape I was in and perfect living superhero style, that I saved them millions, I felt so valuable to the film. Would I have loved to played the part as well? Without a doubt, but this town is about finishing a marathon, not a sprint. How did they approach you for the role? I got an audition from my agent in New York City to report to Warner Brothers to try out for a body part in a movie called 'Watchmen.' My first questions was, "What is 'Watchmen'?" They told me a quick back story and said I would be going out for the body of Dr. Manhattan. At the end of their explanation, I was still lost as to what the job entailed, but considering it was with Warner Brothers, I was all in. What was your diet and training like for this role? My diet and training for the role was exactly the same as my normal fitness cover modeling training, considering that was the look they casted me from out of hundreds, figure I don't go fixing something that wasn't broken. You also just got done filming Terminator 4. What was that like? Being on the set of Terminator Salvation (T4) was the highlight of my career to date! Growing up, I remember vividly watching Arnold in all the Terminator films with my cousins and friends. I even remember dressing up as a Terminator for Halloween, and now to be apart of the history and name of such an unbelievable collection of work that has touched so many people in so many ways makes me prouder then words can describe. To add honor to already an unbelievable opportunity, the director, McG, was a class act stud to work for. His energy and professionalism inspired me to work my @ss off and burn the midnight oil to give it my all. Whenever you work with total professionals whose talents are endless, the work produced by all is elevated to everyone's best. Can you give us a little dirt on the character you played? "I Was Unable To Really Show Off The Efforts In The Gym On Film." The character I play is called 'Hybrid,' and I am half human and half machine. I am the last machine stopping the humans breaking into Skynet's systems. Not much more to say other than that. Well, I guess I can say I get my @ss kicked and die, but I am sure that was expected anyway! What did your diet and training look like for this role? Surprisingly enough, my character was considered the perfect human replica and I was wearing a full metallic suit for the duration of the film so I was unable to really show off the efforts in the gym on film. It was funny though, the majority of the characters in the film are extremely dirty and almost grunge style, expect for me in my pressed suit. Whenever we broke for lunch or dinner, everyone would rush off to the food, but before they would release me, I had put on a protective suit to ensure I stayed clean of everything. Talk about feeling like a diva... a bit uncomfortable! You were also on the hit TV show "Workout" on Bravo. What was that like? Being a trainer on Bravo's hit reality show 'Workout' was all and all a great experience. At times it was anything of what I expected, but with any reality show, that is expected. I didn't want to have prejudgments going into the show, so I made sure that I didn't research the show or the other trainers by watching the previous seasons, which I think made the show 'more real' as I was learning everyone style, character, strengths and weaknesses as the camera's rolled. The biggest fear for anyone on any reality show is how will the editors and producers turn the show and what storyboard will they go with. The material they capture can go either way for the most part with the power of the editor, so for me to stay a step ahead, I worked really close with the producers and editors to see what they were looking for and helped them to push stories or ideas into reality on tape. Besides how the show might or might not have outlined someone, each and everyone on the show were great to work with and an honor for me to call them a friend now. I miss the show and the cast and crew and was proud to be apart of it's last season. I would have enjoyed doing another season with them, but with everything, there is a start and finish... just have to enjoy the ride while it lasts. "MOVIES WERE ALWAYS SOMETHING I LOVED TO WATCH AND GET INSPIRED FROM." Being a personal trainer to a dedicated person who has work ethic and drive is a true blessing. To work with someone day in and day out and seeing them at their best and worst, working with them to overcome fears and limitations, being their strength to say yes when their body says no and ultimately watching them grow in physical strength and overall mental confidence is so powerful. Watching a client transform physically and mentally into a strength they didn't know they had transforms all around them into something better and as a trainer to witness such a moment simply humbles one with such pride. If asked to do another season with Jackie, would you do it? Jackie is a cool chick in my book. I enjoyed getting to know her and working with her on the show. With anyone, I always try to find the good in them and associate with that aspect of them. Jackie is an extremely talented and successful entrepreneur who I call a friend and do hope to work with again on future projects. A complete 180 from fitness modeling, you were also on another hit TV show "Design To Sell". Can you tell us a little bit about the projects you got to work on for that show? 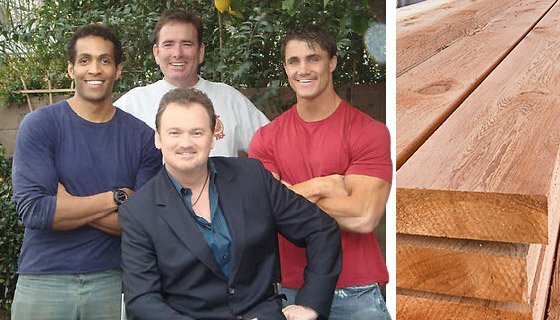 The premise of HGTV's number one show, Designed to Sell, was that given a homeowner ready to sell, we would come in with a 2000 dollar budget and remodel two to three rooms and after our time on location. The home would go on the market and get top dollar. The jobs we did ranged from landscaping, kitchens, bathrooms, and overall complete remodeling. Is carpentry something you enjoy? Carpentry and woodworking is my all time favorite hobby. I recently bought a home in Los Angeles and since then every free moment has gone into remodeling the home. There isn't a single room in the house that hasn't been overturned. I mean, I love it so much that I know almost everyone at Home Depot by name because I'm in there all the time. So to land a TV show where I get to do what I love and get paid for it with some television exposure was a great first job in LA. "On The Set Of HGTV's Number One Show, Designed To Sell." What can we expect to see from Greg Plitt in the future? Any big plans? I have huge dreams and plans for the future and I have yet to really even touch the surface of it. I guess I am somewhat superstitious in that I will never talk of something before there is something to talk about for fear of jinxing the possibility of it coming true. Actually, even if there was something to talk about, I'm the kind of guy that thinks any accomplishment should speak for itself, if one has to talk up an achievement they only cheapen the achievement all together. Is there anything you would like to add to this interview that we didn't cover that you would like the readers to know? I have a new website launching at the end of May that I am really proud of. I have been working on it for the past 5 months developing the site. I am constantly getting asked questions about workouts, training, diets, nutrition, etc, so I put together a site the tells all that I have learned over the past 15 years of working out in the military, sports, and modeling. "I HAVE HUGE DREAMS AND PLANS FOR THE FUTURE AND I HAVE YET TO REALLY EVEN TOUCH THE SURFACE OF IT." I have created full length videos for each workout I do and I have filmed myself doing the entire workout as I explain the techniques, tips, and form through the workout as if the viewer was a fly on the wall with me. I also included a blog on training tips, videos of behind the scenes on cover shoots, movie sets, commercials, as well as video of 'a day in the life' of what I do on my spare time to include skydiving, repelling, surfing, construction, etc. The site covers everything I do and know about fitness and I cannot wait to share my information and education with everyone. Get Ripped with Greg Plitt's MFT28! Ready to transform your body in under 30 days? Check out Greg's own MFT28 and over 40 more fitness plans for only $8.99/month! The fitness industry is stunned by the sudden death of one of its most charismatic and driven ambassadors. 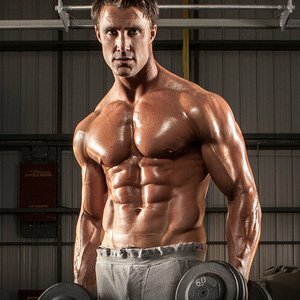 Bodybuilding.com pays tribute to a true original: Greg Plitt. When Alex grew tired of being "skinny fat," he combined hard-earned discipline with a newfound love of weights. Try goblet and landmine squats and experience gains in strength, size, and form faster than you can get under the bar.